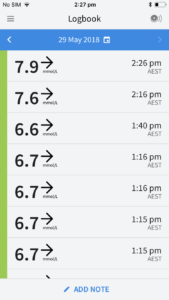 I must admit that I couldn’t get too excited at the news of FreeStyle LibreLink hitting our shoes Down Under. However I was really blown away by the response to my vlog last week, which suggests that perhaps I am in the minority on this new smartphone app. FreeStyle LibreLink is a smartphone app that can either complement or replace the fundamental role of a FreeStyle Libre reader. So if you are thinking about trialling or getting started with a FreeStyle Libre system, you will no longer need to invest in a $95 reader. I also thought that LibreLink may be advantageous to parents or loved ones, who could have their own access to the data provided they scan the sensor with their respective devices (devices don’t share data). Abbott told us that while LibreLink was originally due in August, they have fast tracked the launch as a show of their commitment to get their technology into the hands of as many people as possible. The FreeStyle Libre system utilises Near Field Communication (NFC) technology in order to scan the sensor and obtain a blood glucose reading. In order to use the FreeStyle LibreLink app, your phone must have these same NFC capabilities as the FreeStyle Libre system, and this is the reason for limitations on compatible phone models. So, blame Apple. Or Samsung. Or whoever else you feel like blaming. Apple users will need an iPhone 7 or higher, running on iOS 11 or higher. Android users will need a phone with NFC, running on Android 5.0 (Lollipop) or higher. 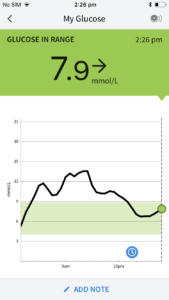 If you wish to use your reader in conjunction with the LibreLink app, you must activate a new FreeStyle Libre sensor with your reader, followed by the LibreLink app during the 60 minute warmup period. If you do not activate with both devices during the warmup period, then you will only be able to read data with the one device you activated with. Why can LibreLink only be used with a new sensor, and not an existing one? I am told this is purely for security reasons, otherwise I could theoretically approach anyone wearing a sensor and scan it. 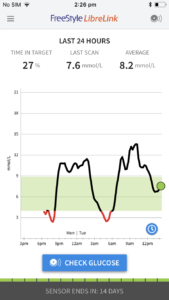 My loaner iPhone seemed to scan my FreeStyle Libre sensor just as well as my reader did. A reading is best taken by pointing the top end of your iPhone, where your ear rests, over the sensor. 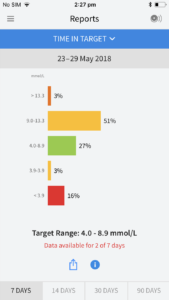 One noteworthy feature is the text to voice, which will voice your blood glucose level and trend following a scan. This may prove useful when you’re in bed and don’t want to open your eyes, or if you’re wanting to interrupt someone else’s presentation and show off your reading of 6.6 and steady to the rest of the group (sorry, Kim!). 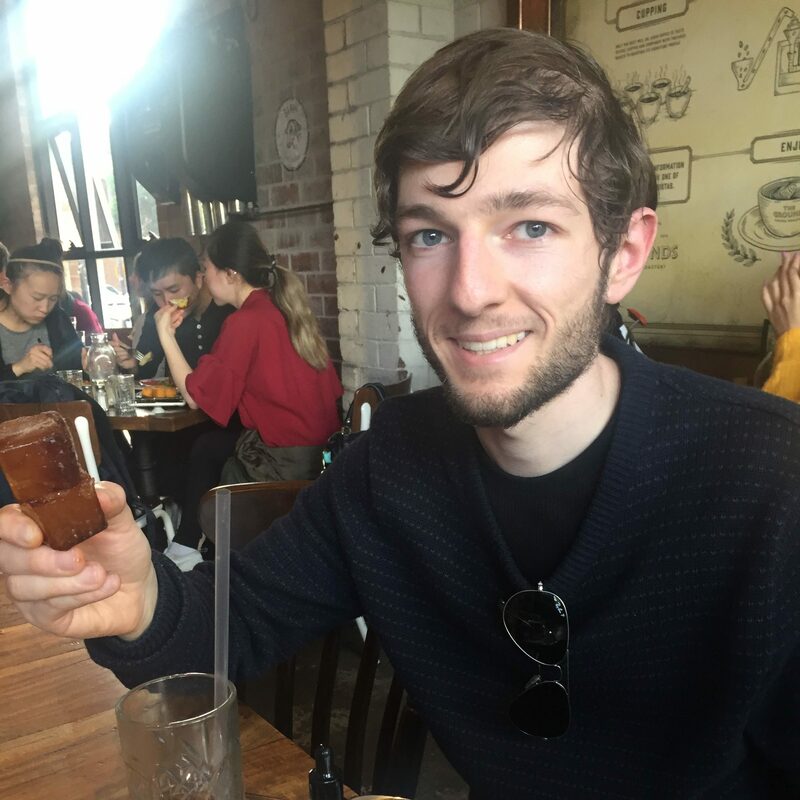 I also think that the app will be really valuable for accessing blood glucose reports without the need to upload to a computer. I must admit I can’t remember the last time I uploaded my pump or my meters to the computer. 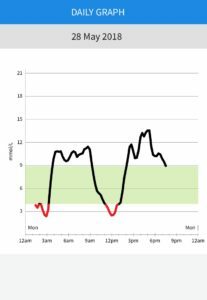 In the whole scope of managing diabetes, little tasks like these often slip and features like this really do make a big difference. 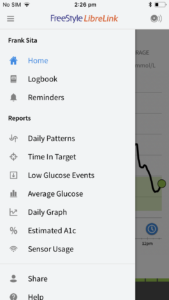 LibreLink does not have the capability to transmit blood glucose data to another device. Nor can data be shared between a phone and a reader. You know how you can click on that little forward button when browsing your iPhone to share a link or a photo? That’s basically how you can share things like screenshots or reports from inside the LibreLink app with others. Everything else that you’re used to seeing in the reader is there, with a bit of an expanded view. Also on the horizon is Libreview, a cloud based software designed as a companion to LibreLink that provides a way to share data with healthcare professionals. I don’t have any plans to upgrade my old iPhone 6 anytime soon to use the LibreLink at home. I’m also not sure that I view carrying my Libre reader around as a hassle. Having my iPhone on me all the time can be equally distracting. Another reservation I have is the increased demand placed on my iPhone’s resources from the introduction of two new mobile apps in the space of a week (YpsoPump app and LibreLink). That being said, I have definitely underestimated LibreLink. 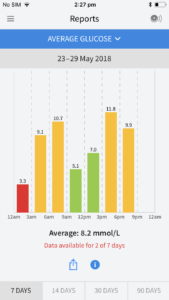 It’s fantastic that FreeStyle Libre users will have more ways to access and engage with their blood glucose data. More choice for people with diabetes is always a good thing. The FreeStyle LibreLink app launches in Australia tomorrow, and is available as a free download from your Apple or Google Play store on a compatible device. Disclosures: Abbott Diabetes Care covered my travel and accommodation costs to attend DX2Sydney. I was fed and watered across the duration of the event. I was also provided with a FreeStyle Libre sensor and a loaner phone if I wished to trial the FreeStyle LibreLink app during the event. There was no expectation that I would blog about anything covered at the event. My opinions and my time, including the annual leave I took from work to be there, are my own. Hmm, it is not here as yet. I hope Abott will move the ball forward to being a full on CGM someday. Are the sensors reusable? seems a bit expensive if you have to pay $92.50 every fortnight for new sensors. No, the sensors aren’t reusable. They are a cheaper option than traditional CGMs like Dexcom and Medtronic, but yes the $92.50 is still out of reach for many (I don’t use it full time, either). Just stumble on our blog. Great stuff. Thanks for doing that. I’ve been using Freestyle since August 2016 (almost two years now) and it has changed my life (for the good of course; but that’s another story). I was glad recently to see that the mobile app was at long last available in Australia. I’ve started using it a couple of days ago and for now I am find it quite good. One limitation is that the sharing (I mean exporting data in the cloud to connect a cloud service to it) doesn’t seem to work (or be set up) yet in Australia. Would you know details about that, and if Abbott is planning to provide this in the future? Alternatively, being able to save the data from the app would also be interesting but I haven’t found a way to do it. I only got to use the app for 24 hours, so I didn’t have a lot of time to play around with it. My understanding is that there is a cloud based software on the horizon called LibreView, which is where you can export your data to. But i don’t think it has launched yet in Australia. I’m not too sure if other third party software like Diasend/Glooko would be able to receive the data from LibreLink, but that could be worth trying as well. Anyway, thanks for your pointers, I guess this is an evolving situation and that hopefully we’ll have the Libreview thingy working soon.